Marc Miot (F4E), Gerhard Kreiner (ESA), Jose Travesi Garcia (EUMETSAT), Elena Llopis (ESO), John Steel (CERN), Radoslav Sinkovic (F4E), Tomasz Smolarek (EMBL), Malika Moussi-Kunstig (ESRF) and Helen Feetenby (EUROCONTROL). 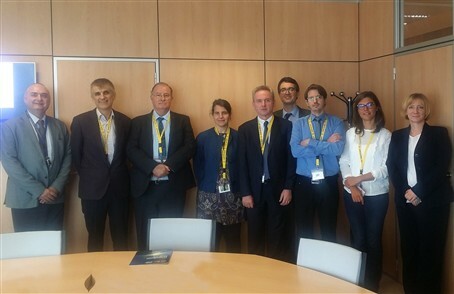 On 1-2 October 2018, internal auditors from CERN, EUROCONTROL, EUMETSAT, EMBL, ESA, ESO and ESRF joined F4E in Barcelona to exchange practices and share their knowledge in complex environments. It was recognised by all that although the internal audit functions in international organisations have limited resources, they constitute an essential part of the system of “checks and balances” in public organisations. The meeting, hosted by F4E’s Internal Audit Capability, was a very good impulse to improve the ways of working and to further build on this professional networking event.